It’s almost a certainty that Scott Wilson and Eddie Hasan didn’t think that what the St. Louis construction industry needed was one more meeting on racial inclusion. But Wilson, CEO of S.M. Wilson, and Hasan, longtime activist in the African American community and former head of MOKAN, reached out anyway to their personal contacts and convened a meeting last Friday afternoon at the Construction Training Center on Knox Industrial Court. Their purpose: to get a conversation going. Shortly after the formation of the governor’s Ferguson Committee, Wilson was visited by Hasan, a long friend, and Rev. Spencer Booker. “I was contacted by these gentlemen because they view me as a conduit of sorts between some in the African American community and some in the majority business community,” Wilson wrote in an email to friends and colleagues. “Eddie and Spencer know the Ferguson Commission has its own roadmap and a course of action it must follow, but the three of us also agree there is plenty of room for other groups to meet independently and challenge those attending with at least understanding the breadth and depth of the issues that have led us to calling these meetings in the first place. It’s time to talk. About 20 persons attended the meeting, with about an equal representation of construction industry and African American community leadership. The meeting was facilitated by Rebeccah Bennett, principal of Emerging Wisdom, a coaching and facilitation practice, and founder of the InPower Institute. Under the agenda heading “Making a Case for Change,” the meeting began with a presentation on the study and report “For the Sake of All” by Jason Purnell, PhD, MPH, assistant professor in the George Warren Brown School of Social Work at Washington University in St. Louis. Dr. Purnell headed the team that produced the study and report (click to download the report). For the Sake of All is a multi-disciplinary project on the health and well-being of African Americans in St. Louis. The first phase of the project culminated in May, 2014 with the release of a final report at a community conference. The second phase will focus on engagement of the community, business leaders, and policy makers in order to mobilize support for implementation of recommendations made in the initial phase of the work. The recommendations are 1) investing in quality early childhood development, 2) creating economic opportunities for low-to-moderate income families, 3) investing in coordinated school health, 4) investing in mental health awareness, access, and surveillance, 5) investing in health-promoting neighborhoods, 6) enhance chronic and infectious disease prevention and management. The study and report show that African Americans in St. Louis are focused in geographical pockets of poverty, marked by poor education, and lack of opportunity. While it is generally known among public health professionals that poverty results in shorter life expectancies, the “Sake of All” study graphically revealed just how profound that impact is. 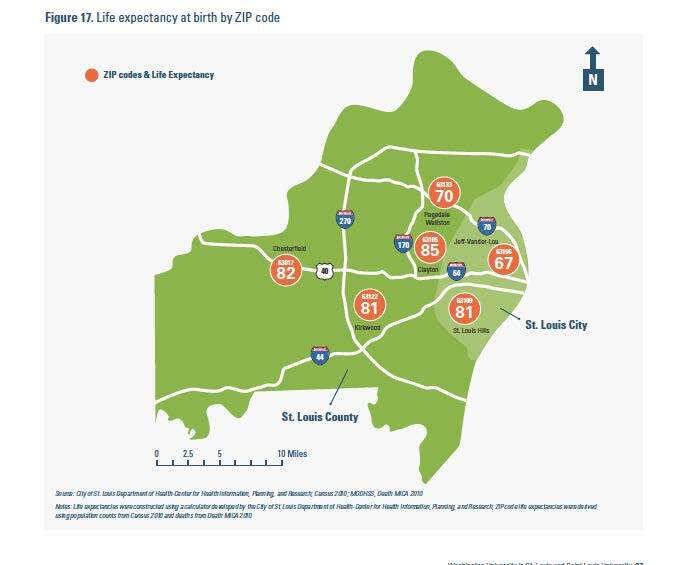 The study showed, for example, that persons living in the 63106 Zip Code have an average life expectancy of 67 years, while those living in 63105 can be expected to live 18 years longer. To say that the discussion was both engaged and spirited would be an understatement. Scott Wilson said that his eyes had been opened to the importance of early childhood education and teaching of skill sets to success in later life. Dr. Purnell said research shows that by the time children from disadvantaged African American households reach kindergarten they, on average, have spoken 30 million fewer words than children of privileged Caucasian families. Wilson noted the AGC’s inability to make a go of the Construction Careers Center despite years of effort and a large investment. He said that when the school received students in the ninth grade they were so far behind in educational and social skills that the deficit proved insurmountable. State Senator Jamilah Nasheed said that construction was one of the few industries willing to employ African American men returning to their families after time in prison. Bob Fritz, Clayco vice president and project manager for the ACW alliance on BJC’s billion dollar Kingshighway campus project, told the group that Clayco has an internal goal of 25 percent employment diversity companywide. He said that he would prefer that instead of project-specific goals and “all that paperwork,” that inclusion be based on a company’s overall employment. Hasan spoke enthusiastically in favor of Fritz’s proposal, noting that project-specific inclusion seldom resulted in long term employment. Fritz said that ACW is also working with all apprentices – whether or not they are African American – on “soft skills” such as interfacing with the public and personal money management. At that point a longtime African American activist Anthony Shahid, who has a long history as a provocateur and was frequently seen on news coverage of Ferguson wearing a cartoonish police hat and a noose and stuffed toy dogs around his neck, told the group that the activity of the group was all “just talk.” In a brief string of epithet-laced invective he accused the local construction industry of “dogging” (abusing; promising and then reneging) St. Louis African Americans, a frequent theme for Shahid. Tom Heeger, semi-retired CEO of Acme Constructors, a representative on carpenters and ironworkers training groups, and a longtime champion of inclusion responded with a little profanity of his own and a clear message that while he couldn’t speak for the industry those in the room were doing their best to bring about change. Bennett reined in the room and got the discussion back on track. 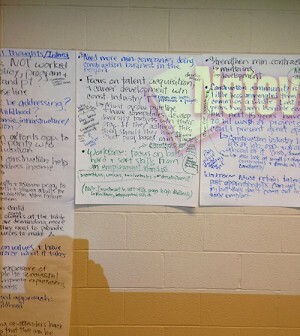 At the end of the two-hour meeting, sheets of newsprint taped to the wall were filled with ideas. There were three big take-aways: 1.) The construction industry could make a big difference in the health and welfare of the St. Louis African American community; 2.) There needs to be a greater focus on providing young African Americans with success stories in the industry so that they can see the industry as worthwhile and in coaching them in social skills; and 3.) The future depends on supporting mothers and young children in order to narrow educational deficits. The group voted to meet again and continue the conversation. After the meeting Anthony Shahid and Tom Heeger could be seen off to one side, shaking hands, smiling, and talking. I agree with Anthony about the construction companies pulling the wool over our eyes. They not only give the DBE the run around, but they don’t have black workers on construction jobs in our own neighborhoods. And they have no intentions of hiring workers or DBE companies. It’s heartbreaking to see white construction companies doing city projects up and down Natural Bridge and on MLK with no blacks. This is one of the reasons crime is at a all time high. You guys move out of our areas, but you come back to get money we should be making.